With just two weeks till this year’s April 18 tax filing deadline, many Americans are still sweating over their 1040s, Schedule A’s and self-employment tax worksheets. One reason they might put in a little extra time: the more than $1.3 trillion worth of tax breaks that are allowed under the Internal Revenue Code. That’s the total estimated impact for fiscal year 2016 of the nearly 200 major “tax expenditures” – government lingo for tax breaks – that come in the form of exemptions, deductions, credits and other special provisions, according to an annual staff report from Congress’ Joint Committee on Taxation. Even that $1.3 trillion figure is an understatement, as the report only gives specifics for a tax expenditure if it’s estimated to cost the government $50 million or more per year; dozens of breaks fall below that threshold. Tax expenditures are defined as departures from “normal” income-tax law that benefit particular individuals and businesses. They include everything from the favorable tax treatment of employer-paid health insurance (estimated to cost the government a total of $769.8 billion over five years) to a tax credit for economic development in American Samoa (estimated five-year cost: less than $50 million). The biggest individual tax break was for employer-paid health care, health insurance and long-term care insurance, none of which is counted as taxable income. That provision cost the government an estimated $145.5 billion last fiscal year, and is estimated to cost $143.8 billion this year. Taxing dividends and capital gains at lower rates than ordinary income will keep an estimated $134.6 billion out of the Treasury in the current fiscal year. The controversial mortgage-interest deduction will cost $77 billion this fiscal year, while the accompanying deduction for local property tax payments will cost another $34.7 billion. Economists and tax analysts tend to use the term “tax expenditures” because such special-purpose breaks are effectively the same as direct spending – Congress can appropriate $150 billion for health care or provide an indirect subsidy worth $150 billion through the tax code. While it’s often politically easier to enact a tax break than a new appropriation, financing social programs through tax policy affects both how those programs function and who benefits from them. For example, a recent study of federal tax credits for higher education (which will cost an estimated $21 billion this fiscal year) concluded that most of the benefits go to middle- and upper-income households, and appear to have little impact on whether students go to college at all or what kind of schools they attend. 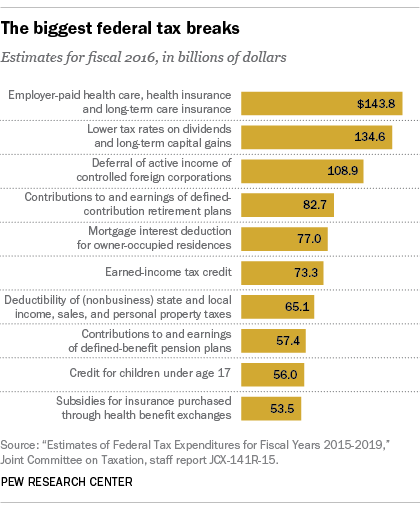 While not all tax breaks mainly benefit the well-off, many do. For instance, taxpayers with incomes of $100,000 or above receive more than 80% of the value of the mortgage-interest and property-tax deductions, according to Joint Committee estimates; more than two-thirds of the value of the deduction for charitable contributions goes to taxpayers with incomes of $200,000 or more. Low-income people, who pay relatively little income tax, can’t take full advantage of many breaks. One exception is the earned-income tax credit, or EITC, which is aimed at assisting low- to moderate-income workers and their families. Unlike most tax credits, the EITC is refundable, meaning that if a taxpayer owes less tax than the credit is worth, he or she receives the excess amount as a refund. The report estimates that more than 80 percent of the value of the EITC goes to taxpayers with $40,000 or less in income. Although all the remaining 2016 presidential candidates have released tax-reform plans, tax policy hasn’t generally been front and center during the campaign – perhaps because it’s not an especially high priority for the public. In a Pew Research Center survey earlier this year, Americans ranked tax reform far behind strengthening the economy, defending against terrorism and improving the educational system as top priorities for the federal government this year. Still, Americans are hardly fans of the existing system. 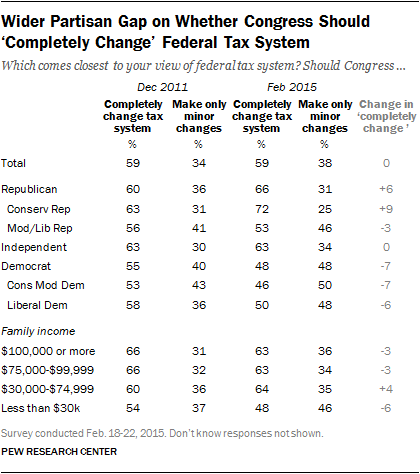 In a survey we did last year, 59% said there’s so much wrong with the tax system that Congress should completely change it (versus 38% who said only minor changes are needed). While that sentiment was more partisan than the last time we asked the question, in 2011, even half of self-identified liberal Democrats favored completely changing the system. Note: This is an update of a post that was originally published in April 2015. Drew DeSilver is a senior writer at Pew Research Center. High-income Americans pay most income taxes, but enough to be ‘fair’? What is a ‘closely held corporation,’ anyway, and how many are there?